That alone makes the restoration and theatrical rerelease of his resistance drama Army of Shadows (1969, aka L’Armée des ombres), unseen stateside in any form since its initial release, an occasion. Melville remains most famous as master of the French gangster film, which he elegantly brought into the modern world with meticulously plotted and smoothly directed post-noir crime classics: the elegant, elegiac Bob le Flambeur, the wonderfully ironic tale of an aging gambler who plots an elaborate heist; the austere masterpiece Le Samourai, starring Jean Gabin’s heir apparent Alain Delon playing a meticulous hit man and the cinema’s most insular existential hero; the heist classic Le Cercle Rouge, the most Melville-ian of Melville’s crime films. The sentimental code of friendship and honor among thieves seen in Bob le Flambeur plays like a winsome wish for a sentimental underworld fantasy threatened by the mercenary impulses of brazen young punks. 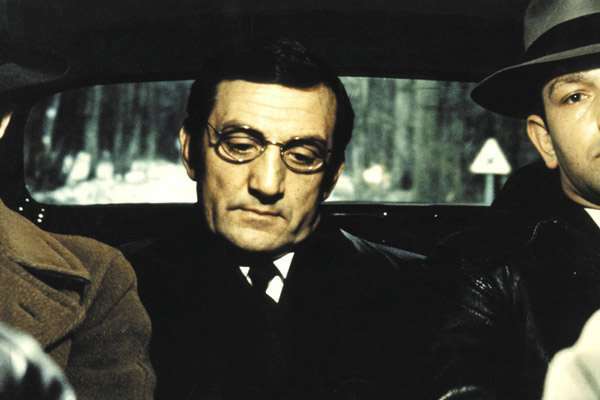 By Le Cercle Rouge, it has hardened into a unforgiving cinema fantasy of loyalty, professionalism, and sacrifice in a rarefied world of classy, uncompromising crooks locked in a symbiotic co-existence with the persistent and obsessive cops, a life that inevitably leads to a romantic doom. Army of Shadows, the third of his three occupation dramas (La Silence de la Mer and Leon Morin, Priest, 1961, are the first two, neither available on DVD as of this writing), shows another side of Melville, one at least partially drawn from his own experience. Melville was never a gangster but during World War II he was a member of the Resistance, worked for French intelligence in London and served in the Free French forces in the liberation of Italy and France. It was during his early days of the Resistance in the South of France that the future director, born Jean-Pierre Grumbach, adopted the name Melville, after American author Herman Melville. Melville had long dreamed of making a film of the 1943 novel by Joseph Kessel, who was also a Resistance fighter who based the fictional characters on real life figures, ever since he read it while in exile in London. “This is my first movie showing things I’ve actually known and experienced,” he told Rui Nogueria in his interview book Melville on Melville. 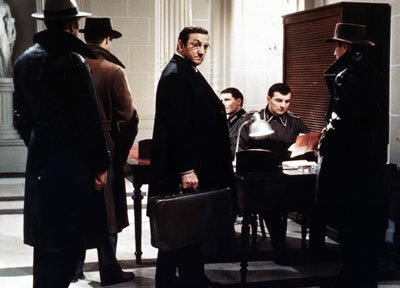 Gangster movie icon Lino Ventura (who previously starred in Melville’s brilliant Le DeuxiÃ¨me Soufflé, 1966) plays Resistance leader Philippe Gerbier with an observant stillness and coiled calm different from any his crime thrillers. Masked only by a pair of glasses and face that betrays almost no emotion, he looks no more dangerous than the accountant next door, but behind the careful body language and deliberate action is a patient and pragmatic man as compassionate to his comrades (especially his devoted deputy, played with understated gravitas by Simone Signoret) as he is resolute with traitors. In the film’s first act, when Gerbier is taken from a Vichy prison camp to Gestapo headquarter for interrogation, his patience and methodical study of his every environment pays off as he executes a daring escape. But there is a brutal ambiguity about the scene that Melville defiantly never answers. It takes two people and Gerbier enlists a fellow prisoner he has never met into his plan. It could be a test for the unknown man (is he a plant? ), a feint (is he up to the challenge? ), or a genuine offer of escape to a fellow resistance fighter, but the upshot is that the mystery man draws the attention and the fire of the guards in his flight to the exit, leaving Gerbier to slip out the side and run to freedom. Melville plays none of it for grand melodrama or heart-pounding action. It takes place almost completely in the daylight, in sparsely populated streets, deserted countrysides, and blandly unmemorable cells and military offices. We’re never shown the ordeal of torture, only the results, and no heroic demises. The deaths we see are the painful sentences the Resistance places on their own compromised people. Even our heroes get little more than a brief obituary, delivered in a terse piece of dialogue or a sobering onscreen notice. If anything, the vision is more fatalistic than any of his Melville’s crime classics. But more resonant than the atmosphere of ever-present danger and death sentences hanging over them all is the feeling of isolation and loneliness that permeates every scene. 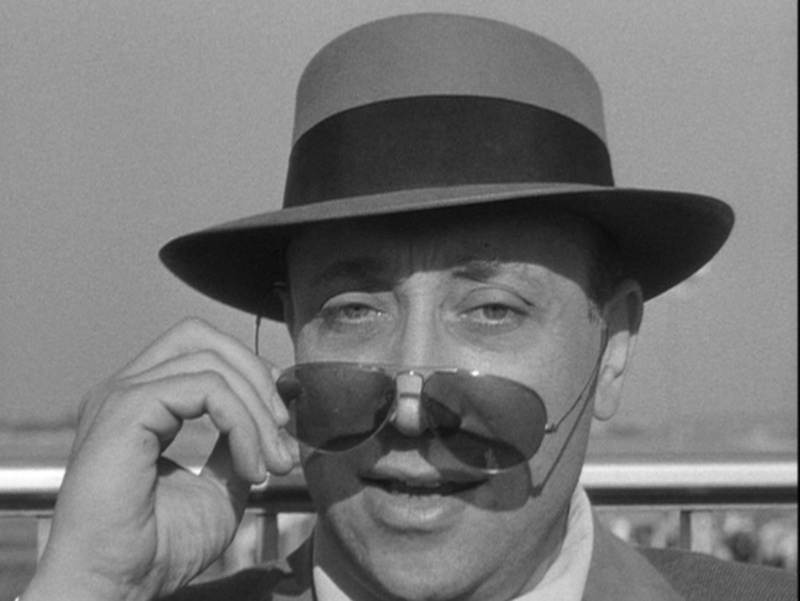 The assignments may play like heists with higher stakes (the iconic trenchcoats help blur the lines), but there is none of the Bonhommie camaraderie of his gangster films, no celebrations of successful missions in a basement café, no rest from the constant surveillance of soldiers and cops making random sweeps. The romantic code of loyalty and honor becomes an unforgiving law of survival: betrayal is death and there is no reprieve. In this world, triumph is being killed in an act of mercy by your comrades rather than executed by your enemy.